Due to my black market connections, your Imperial Majesty managed to get her hands on a Sailor Mars Figuarts back in January. No, not really. When the release date got pushed back to February the company I ordered from accidentally sent me the figure early. Their goof is your gain so I present my thoughts about the Bandai S.H. 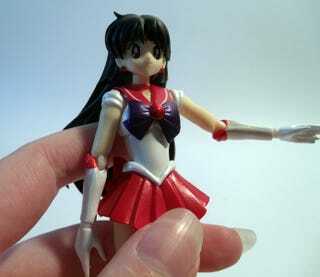 Figuarts Sailor Mars Figure, complete with product shots that would make my product photography weak from failure. Mars is the 3rd figures in the Sailor Moon series, and like the rest, she comes with a bunch of faces and had options so you can mimic her most famous poses from the anime. Unlike my Sailor Mercury figure (which is a story for another time, children) the new place I bought her from actually made sure she came mint. Sailor Mars is known as the no-nonsense member of the group. So outside her default face all her expressions are various forms of anger. Open mouthed anger, closed mouth anger and closed eyes anger. Rei was always pretty bitchy so it's fairly accurate. The figure itself is quite lovely. Unlike the Sailor Moon figure where they subbed the red part of her fuku with a magenta color, Mars' fuku is a nice deep red, with a pretty metallic paint that they used for both her brooch and earrings for each version of her face. Also, all the paint jobs on all the parts are nicely done. My Sailor Mercury figure was missing one earring being painted, so it's nice to see no problem with this figure. One of the coolest features she has is that there are extra pieces of her long black hair that you can fan out and make it look wind-swept. It's a nice extra touch and when the hair is folded it doesn't detract from the overall design of the figure. Like the other figures in the line, Mars comes with her signature weapon, in this case her spell scroll paper. This thing is so stupid. And when I mean stupid I mean mind boggling. Based off of the product photos I had assumed that the ofuda was molded to one of her hands like the Moon Frisbee that the Sailor Moon figure came with. But no, it's a completely separate, tiny, piece of painted plastic. It's kind of an amazing feat of product design, but on the other hand I'm completely terrified I'm going to eventually lose this damn thing. While this is definitely an awesome figure, it still has a lot of the same problems that the other Figurarts have. The hands are still really touch and go. Some fit okay, others are a struggle to get on and for some reason the faces for the figure are a bit tough to change as well, which previously was never an issue. The joints move okay, though it's a real trick to get her into the 'Mars Fire Ignite' pose because the hand piece requires both wrists to be snapped into it. Snapping it is hard enough, but to get the pose just right on her arms without the danger of breaking her is a bit nerve wracking. The other issue was a lack of forethought for her stand. With her hair it the way it makes it difficult to snap the stand around her waist and pose her without either having to have her head tilted down or have her sort of...floating. And trying to pinch from the front or side isn't very stable. All and all if you're a Sailor Moon fan she's definitely an excellent edition to the line. But bear in mind that a lot of the manufacturing errors that the other figures had didn't get rectified in this new figure, and the stand adds a new headache.